Tuesday, November 8th, 2016 – as I woke up on this unusually sunny morning in Oakland, I realized it was the first time I was fully aware of the impact that adults in my community, and our country would have as they voted for policies and politicians. Tuesday was not just another day; for some of my peers at ARISE High School, it was the first time they’d participate in an electoral process, and the excitement was in their faces as they wore the “I voted” sticker with pride! However, the excitement faded away as the night approached, and poll results from the East Coast started pouring in like a bucket of cold water. My nine-minute BART ride from Fruitvale to the East Bay Times office on 19th Street was almost depressive; the gloomy mood was reflected on the faces of students, blue collar workers and professionals, as they refreshed the browser on their phones. I was reminded of how I’d do the same whenever the Warriors played, refreshing my browser every couple of minutes for a score update. As I walked into the former Oakland Tribune office to meet with my fellow Oakland Voices correspondents, I was awakened by a cold reality that would haunt me throughout the rest of the night. While everybody tried to enjoy pizza and drinks, I was glued to the television. I could not believe that entire states around the country actually voted for a man who threatened to damage the lives of many of the people who look like me, and many people who I care for. “He doesn’t have a chance!” I tried to convince myself throughout the whole night, as I would cover a campaign party for Viola Gonzales who ran for a seat in the Oakland City Council for District 5. As we arrived at the family restaurant Guadalajara, in the heart of the Fruitvale district, Viola Gonzales shared her campaign’s last moments with her closest supporters, and just a few blocks away from the incumbent, Noel Gallo’s campaign headquarters. I had prepared for this day; it was my first time covering a story as a reporter. With my Oakland Voices press pass around my neck, and a reporter’s notepad at hand to take notes, I approached a couple who had just walked out of the restaurant from the campaign celebration. Without any formal introduction of what organization I belonged to, I started asking some of the questions I had prepared. Luckily for me, I was with Damu Dailey, an Oakland Voices correspondent, who backed me up and introduced us as journalists with Oakland Voices. I learned my first lesson of the night: before asking questions, introduce yourself first, or people will get scared or creeped off. Our next interviewee would be no one less than the candidate herself, Viola Gonzales. She warmly welcomed us and introduced us to her supporters. Throughout the interview, I was immersed in conversation with the candidate for District 5. I completely forget about the national elections, and I saw hope in her words as she described how she planned on working with my Fruitvale community and her journey as she sought votes, going from door to door and having conversations with the community. While finishing our interview, we received updates from the campaign manager who notified her that her opponent was still ahead. As I glanced at one of many televisions in the restaurant, Trump needed just a couple dozen electoral votes to be our next president. The battle for District 5 seat no longer mattered during that moment. As I headed out, I observed the faces of everyone in the restaurant: the cooks, waiters, people who were sitting with Gonzales. I realized that the results of this Tuesday night were going to impact the lives of everyone in the room and across the nation. Wednesday would be a different reality. 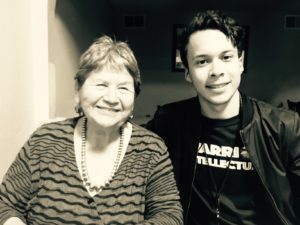 Abel Regalado has lived in East Oakland all of his life and is a senior at ARISE High School, a social justice - oriented charter school. Abel’s passion for tech inclusion and computer science sprouted from the lack of equal resources throughout his community. Abel is the founder of his school's first computer science program, ARISE Hacks, where he introduces his peers to code. Abel understands the life that youth in East Oakland are exposed to, so he is motivated by working with these youth to expose them to the wonders that computer science has to offer. Like many youth in his community, Abel has grown up through adversity, and has been able to overcome family struggles. Because of his resilience, he was selected in the Students Rising Above Class of 2017 scholarship program which will assist him in attending a four-year university to continue his passion in computer science. He has hopes of staying in the Bay Area to attend UC Berkeley or Stanford in the fall of 2017, then bring back his knowledge to his community. Thank you for reminding me of the hope and exitement of those involved in the electorial process for the first time. I also appreciate the hope and excitement from the experienced but not jaded.